Fidel Castro will be surprised to learn that he has become a Guest Columnist in True North. This edition of True North was delayed for logistic reasons that have nothing to do with content. The content may be shocking to some, amusing to others, and sagacious to still others. For the first time we offer from the left of the political spectrum, Fidel Castro, and from the right, Christopher Ruddy. — 173 words. be reined-in by doing time in a club-med jail? But, is it going to do him any good? It’s a question that has come to mind as I read up on the fate of Conrad Black. — 845 words. Michael Bader is a psychologist and psychoanalyst in San Francisco. He is the author of "Arousal: The Secret Logic of Sexual Fantasies" and the forthcoming book "Male Sexuality: Why Women Don't Understand It — and Men Don't Either." He has written extensively about psychology and politics.— 903 words. Paterson has been handed a remarkable opportunity to be not just a state officials but a national leader. In 1999, when New York City activists organized civil disobedience to protest the police shooting of African-immigrant Amadou Diallo, one of New York state's most prominent legislators arrived at police headquarters in Manhattan to be arrested as part of the a remarkable civil rights protest. — 1,311 words. Last week I had the honor of joining the U.S. delegation to the Munich Conference on Security Policy, held in Munich, Germany. The congressional delegation was headed by Sens. Joseph Lieberman and Lindsey Graham. The Munich Conference — closely associated with the NATO alliance — has drawn headlines in recent years.… This year, the talk was muted over U.S policies, perhaps owing to the fact the Bush administration is soon exiting. Europeans believe the next administration led by Democrats will be more sympathetic to their views. Today, Europe appears to have a mindset of accommodation and complacency. Appeasement might be too strong of a word, since there is no Hitler-like figure marching through European capitals to acquiesce to. A U.S. official with NATO told our delegation that throughout Europe, our allies are not making the connection between their own security and the alliance’s work to keep the Taliban out of power in Afghanistan. — 1,123 words. Imagine if President Bush, after 9/11, simply declared war on oil and put the whole nation behind ending our crippling dependence on it. Imagine if we had spent the money we allocated to the war in Iraq toward eliminating the oil addiction. The tab for the Iraq war hovers around the $1 trillion mark and grows at a clip of at least $12 billion a month. The Congressional Budget Office projects that the cost through 2017, including hidden costs such as veterans’ benefits, could total $2.4 trillion. There is little question that America is defending its interests in the Middle East largely because of oil. In his recent memoir The Age of Turbulence: Adventures in a New World, former Federal Reserve Chairman Alan Greenspan wrote: “I’m saddened that it is politically inconvenient to acknowledge what everyone knows: The Iraq war is largely about oil.” — 804 words. Long before I’d ever heard of Fidel Castro I found a book in a used bookstore published by two American doctors in 1938. There are three things about it that I recall: the first is that some casual friends (a couple) borrowed it (I don’t remember the title); the second is that I never saw the book or the couple again (I’ve forgotten their names); the third I remember clearly: the doctors reported that there was virus in Cuba that entered the body through the soles of bare feet and caused the legs to swell so that the patients were immobilized with pain. The doctors said that they had discovered a serum that when injected caused the swelling and its pain to disappear. The only problem was that most Cubans were too poor to buy shoes. So the obvious cycle developed among those lucky enough to receive the injection. — 896 words. LONDON — An unhealthy obsession with celebrity culture is damaging students' academic success, a survey of teachers has found. — 292 words. David Ewald (davide@ewald.com) is president of Ewald Consulting in St. Paul, Minnesota. With nearly 100 stores in 18 states, Gander Mountain is the nation's third-largest outdoors retailer. Unlike its two larger competitors, Bass Pro Shops and Cabela's, Gander Mountain has achieved impressive growth without seeking targeted tax incentives from state or local governments. In this interview, Gander's chief executive, Mark Baker, tells us why he believes government officials should oppose retail tax incentives. — 1,126 words. Readers have asked True North to give space to spiritual matters. A search for more than half-a-year has confirmed the following biblical encouragement, the sense of which advises, Ye need but seek, and ye shall find. True North is proud to introduce The Reverend Hanns F. Skoutajan who has undertaken to provide readers with spiritual guidance. The Roman Catholic Church has been primarily responsible for the institution and propagation of the feast of the patron saint of Ireland. Although not known for its flexibility in doctrinal matters it has in this instance made adjustments. — 570 words. If further proof were needed that President Bush resides in a dream world, he settled the issue on Thursday definitively. Speaking by videoconference with U.S. military and civilian personnel in Afghanistan about the challenges posed by war, corruption, and the poppy trade, the president unleashed this comment: — 492 words. WASHINGTON -- The United States took aim at Russia on Tuesday for its human rights record, accusing the government of corruption, harassment of the media and electoral abuse and the security forces of killings and torture. — 207 words. The FBI has increasingly used administrative orders to obtain the personal records of U.S. citizens rather than foreigners implicated in terrorism or counterintelligence investigations, and at least once it relied on such orders to obtain records that a special intelligence-gathering court had deemed protected by the First Amendment, according to two government audits released Thursday. — 792 words. How much can an annual heating bill be reduced by planting trees beside a home? NEW ORLEANS — Two-and-a-half-years after Hurricane Katrina, tens of thousands of homeowners are still waiting for their government rebuilding cheques, and many complain they can't even get their calls returned. But the company that holds the contract to distribute the aid is doing quite well. — 444 words. The “Freightliner Five” were fired after leading a strike against givebacks. By Tiffany Ten Eyck Labor Notes Alternet.org — Pounding the pavement in a two-month tour of cities throughout the Midwest and West Coast, four fired United Auto Workers members have been busy speaking to supporters in a quest to get their jobs back. — 1,337 words. Were Brad and Jennifer doomed from the beginning? Brad Pitt "despised" his ex-wife Jennifer Aniston after just six weeks of marriage, claims actor Omid Djalili. Omid, who met Brad on the set of Spy Game in 2000, gave the actor marriage advice after Brad admitted he wasn't happy with Jennifer. — 264 words. HAVANA — The president of Canada's Olympic Committee, Michael Chambers, arrived here Wednesday to attend Cuba’s Terry Fox Run. — 182 words. There appears to be no end in sight for the sliding greenback. This dollar of ours is rapidly falling to depths where no dollar has gone before. In fact, to say that it's unclear when we can expect a recovery would be a gross understatement. — 1,176 words. Sometimes we ‘Westerner’ immigrants from Europe believe that the Europeans, whether British or French or others arrived in North America and brought civilization to the Natives that were already here. Our superior attitude may not stand up to investigation. — 197 words. I was disappointed Daniel Day-Lewis won an Oscar for There Will Be Blood, not because he's not a great actor (he is), but because the movie was such a betrayal of the book on which it was based. — 1,666 words. 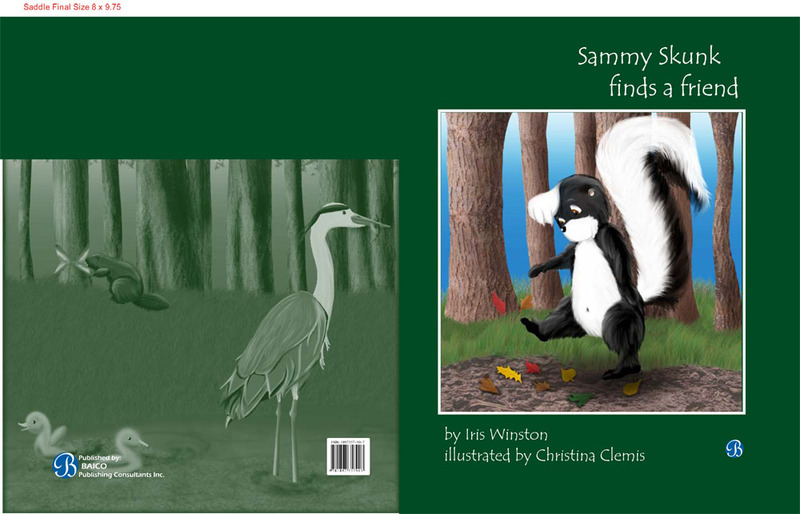 Sammy Skunk is very lonely when he moves to a new part of the forest. His mother tells him to find new friends and says "the way to make a friend is to be a friend." See how Sammy tries to show Sally, Seth and the other squirrels how good a friend he can be. For more please click here.